Napkin bands are useful at restaurants who wrap their own silverware and cutlery. Caterers use these often to present a nice, clean table layout at a reception or banquet. You can wholesale napkin bands from the restaurant supply leader. Evergreen Napkin Bands Paper Red - 4.25 in. x 1.5 in. Evergreen Napkin Bands Paper White - 4.25 in. x 1.5 in. Evergreen Napkin Bands Paper Black - 4.25 in. x 1.5 in. Evergreen Napkin Bands Paper Burgundy - 4.25 in. x 1.5 in. Evergreen Napkin Bands Paper Hunter Green - 4.25 in. x 1.5 in. Red Flat Napkin Band Paper - 1.5 in. x 4.25 in. Napkin Bands Forest Green - 1.5 in. x 4.5 in. Napkin Bands White -1.5 in. x 4.5 in. Napkin Bands Burgundy - 1.5 in. x 4.5 in. Napkin Bands Black - 1.5 in. x 4.5 in. Napkin Bands Red - 1.5 in. x 4.5 in. White Paper Napkin Band Retail Package - 1.5 in. x 4.25 in. Napkin Flat Burgundy Paper Shrink Wrapped Band - 1.5 in. x 4.25 in. Band Napkin Hunter Green Paper Retail Packaged - 1.5 in. x 4.25 in. Band Napkin Wrap nroll White Paper - 1.5 in. x 4.25 in. Reflex Blue Paper Band Napkin - 4.25 in. x 1.5 in. White Paper Band Napkin - 4.25 in. x 1.5 in. Black Paper Band Napkin - 1.5 in. x 4.25 in. Hunter Green Paper Band Napkin - 4.25 in. x 1.5 in. Burgundy Paper Band Napkin - 4.25 in. x 1.5 in. 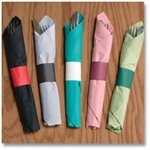 Napkin Bands for catering and restaurants.